No one ever tells you how hard it is to be an adult. As a kid, you think that being an adult means staying up past 10 p.m. and being able to eat candy for dinner. As an adult, you can’t keep your eyes open past 9 p.m. and are eating more spinach than you ever thought you would. As a teenager, you think adulthood means not having to listen to anyone ever. But when you’re an adult, you very quickly realize you have to listen to your boss, your landlord, and, yes, your parents. But all of these somewhat superficial facets of life don’t compare to the real hardships of adulthood. Your friend is diagnosed with cancer. Your car breaks down and you have no money for a new one. You get laid off. Your dad has a heart attack, and you and your siblings have to make tough decisions about life and death. Your roof is leaking. Your sister hasn’t spoken to you in years. Your best friends get a divorce and make you choose between them. Your mom is diagnosed with Alzheimer’s and has to move in with you. Your spouse gets a new job, and you have to move across the country away from all your friends and family. Your son might not pass the third grade. Life is hard, friends. And it certainly doesn’t get any easier the older you get. No matter what suffering heads your way, you’re never fully prepared. The Bible is an incredible source of comfort for life’s challenges. The Psalms, especially, speak to the wide range of human emotions we feel! One word of caution, though. Often, we look to God and His Word as superficial sources of comfort. We say, “It will all be okay! God has a plan for my life! This too shall pass!” And while that is true, we absolutely cannot limit God to only making our earthly lives more bearable. We must keep an eternal perspective, focusing on the salvation we have in Christ. But that isn’t meant to devalue or brush off the difficulties of life on earth. Your disappointment, hurt, sorrow, and heartbreak are real. So, with that being said, here are some Bible verses for when life is just really hard. This is one of my all-time favorite psalms. You can sense David’s desperation in his repetition of “How long?” and that repetition echoes the ongoing feeling that accompanies a difficult season of life. How long will life be this hard, God? At the end of the day, David’s hope is still in the Lord. He hasn’t forgotten the sorrow in his heart, and he hasn’t seen relief—but he trusts, rejoices, sings, and hopes in the Lord in the midst of his distress. In this verse, Jesus acknowledges that the Christian life will not be easy, but He also promises that we have a greater hope in the world to come! Some people turn to this verse for comfort with their eyes solely focused on this earth, but the promises in this verse are rooted in the new heavens and the new earth. We have a hope that is beyond our transient time on this earth, where we can look forward to living in God’s presence forever on the Last Day. We cannot even keep track of our own tossings and tears—how much does our heavenly Father love us that He knows and remembers each time we cry? In the midst of heartache, we can take comfort in the knowledge that God has not abandoned us. He is watching over us and loves us. 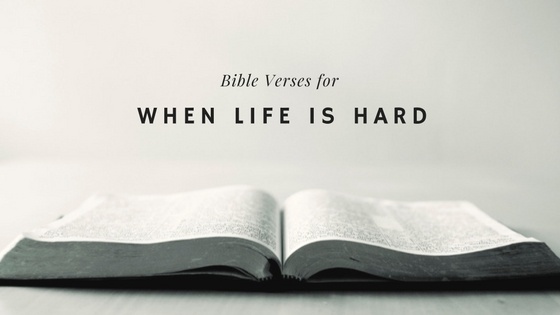 What are your favorite Bible verses to turn to in times of heartache, mourning, and grief?